"'My husband game me a bread machine for Christmas the year we were married, and I use it about once a week,' notes Janet Vink from Geneseo, Illinois. 'We like slices of this bread with a spaghetti dinner and often use the leftovers for French toast.'" In bread machine pan, place the first five ingredients in the order suggested by the manufacturer. Select dough setting (check dough after 5 minutes of mixing; add 1 to 2 tablespoons of water or flour if needed). When cycle is completed, turn dough onto a lightly floured surface. Divide in half. Roll each portion into a 10-in. x 8-in. rectangle. Roll up jelly-roll style, starting with a long side; pinch seams to seal. Sprinkle a greased baking sheet with cornmeal; place loaves seam side down on prepared pan. Cover and let rise in a warm place until doubled, about 20 minutes. Whisk egg and water; brush over loaves. With a sharp knife, make four shallow slashes across the top of each loaf. Sprinkle with sesame seeds if desired. Bake at 375 degrees F for 20-25 minutes or until golden brown. Cool on wire racks. This bread was quite flavorless. Not enough salt or yeast to be authentic. 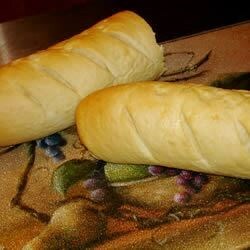 However, it does have a nice consistency but not one I would associate with a true french bread. you can add 1 tablespoon of olive oil this will soften the dough and add a cuople of days of shelf life..that is if it ever lasts that long!